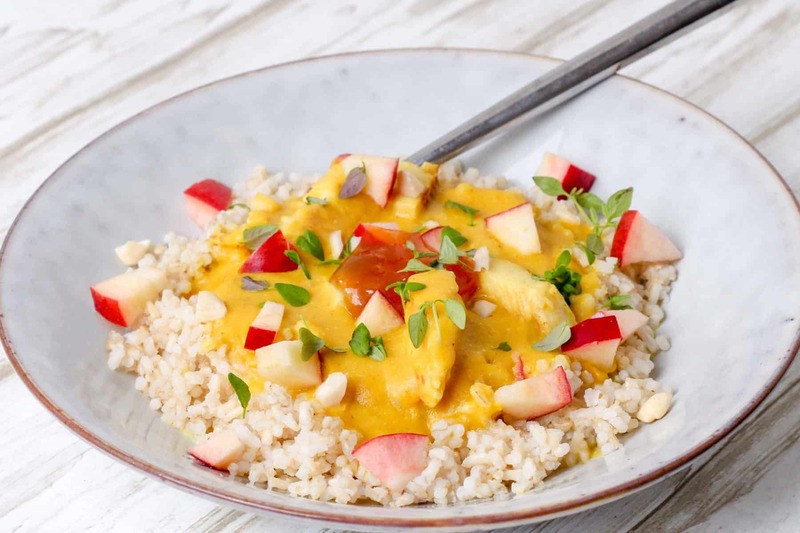 Chicken curry is a guaranteed hit in the Mambeno house, and this version features butternut squash hidden in the sauce, making it creamy and delicious. Remember, this dish is for two days, so save the leftovers for an extra easy dinner tomorrow. Enjoy! 2. Peel and dice butternut squash, apples and onions. Save a bit of apple for garnish.Cook the lot in a bit of olive oil in a pot or deep pan. Add curry, water, single cream and coconut milk and stir well. 3. Peel the ginger, grate it on the fine side of a grater and add to the sauce. Let the lot cook for 10-15 minutes, until the butternut squash is tender. Meanwhile, prep the chicken. 4. Cut the chicken into bite-sized chunks, remembering to wash your hands and utensils after. Cook the chicken on a pan with olive oil, until the chicken has a bit of a sear. Remove from the pan and place on a plate. 5. Blend the sauce with a hand blender on a low speed setting, to keep the sauce from sputtering more than absolutely necessary! Season to taste with salt and pepper and if needed, thicken the sauce with a bit of corn flour stirred out in a cup of water, or add a bit more water if you think the sauce is too thick. Add the chicken to the sauce and let simmer, until the chicken is cooked through - but not dry! 6. Serve with piping hot rice, mango chutney and garnished with a bit of apple. If you want a bit more power in the flavour, you can swap curry for red or green curry paste. But proceed with caution! All curry pastes are different, so only add a bit at a time! Tasks for kids in the kitchen: Let your kids dice the butternut squash and apples.